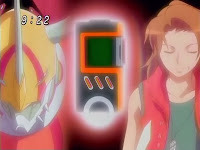 Digimon: System Restore: Data Squad Episode 38: The Power of The Burst Mode! Lately, we've noticed the unfortunate trend of DATS not actually being able to do anything productive. They've been beaten or out-maneuvered at every step, and we don't typically take kindly to good guys on a losing streak. Kurata's efficiency and preparedness has eased the blow by providing legitimately impressive competition. Unlike the Frontier kids taking the totally wrong approach against the Royal Knights, DATS is making the right moves and scoring partial victories... just losing the overall war. Now, at last, they have redeemed themselves in a satisfying way, making the most out of the advantages they have while Kurata falls after distancing himself from his successful strategies. As dangerous a threat as the Gizumon XT posed to Digimon and as much as Kurata gave himself an accessibility advantage, what really made him so dangerous was that he could do it all in bulk. One Gizumon XT could certainly do a fair share of damage, but it was beatable, even by Digimon less powerful than those enlisted with DATS. Kurata's success was not in creating them, but in creating thousands of them. That's how he was able to overwhelm the Digital World, and if that had truly been his ultimate goal he would have been successful. When it came down to destroying Eldradimon, he occupied its defenses and was able to draw them to the human world, where he had the whole damn defense force on his side. There's no way DATS is competing with that. The only times Kurata failed were when he over-specialized. The Bio-Hybrids were his special troops, requiring a major commitment to science and three human guinea pigs. For everything he put into them, he had to upgrade them after a couple battles, and even then they lost. All that investment and they proved to be little more than a distraction while the Gizumon got things done. But once Belphemon came onto the scene, the Gizumon disappeared. Kurata could have outfitted the Gizumon to kill humans and human world infrastructure as effectively as they kill Digimon. By relying on Belphemon and Belphemon alone, he puts himself in a very precarious spot. While Kurata limits himself to Belphemon's power, awesome that it may be, DATS gets steadily stronger as a unit. Just in this one battle, Ravemon's joined the fray while RookChessmon and BishopChessmon have been integrated into the attack plans. With Agumon back into the fold, suddenly these guys are quite formidable. Thomas proves to be quite the general, getting the most out of all six units in impressive fashion. It's the kind of battlefield tactics we haven't seen in quite some time. One of Thomas's smartest moves was recognizing that ShineGreymon has the best opportunity to do damage. He sets up ShineGreymon to get the big shot... and it doesn't work. In the meantime, Kurata and Belphemon are proving to definitely not be on the same page. A disfigured Kurata pops out of Belphemon's chest, a moment that surely won't give anyone nightmares at all, and Kurata proceeds to drain the city of its power, slice up a truck, and use the space oscillation bombs inside to start tearing up the divide between the two worlds. It's a good thing the rest of the team gets in a moment of support, because it's sort of a shame that Marcus's awesomeness dominates the rest of the episode. It's the first time we got to see the members of DATS firing on all cylinders in unison and we could have used more of it. Also, Marcus's cries for power are totally overblown and cheesy and felt more suited for last episode. But what a scene it ends up being as Marcus and Agumon perfect their bond and activate the Burst Mode, finally taking down Kurata. 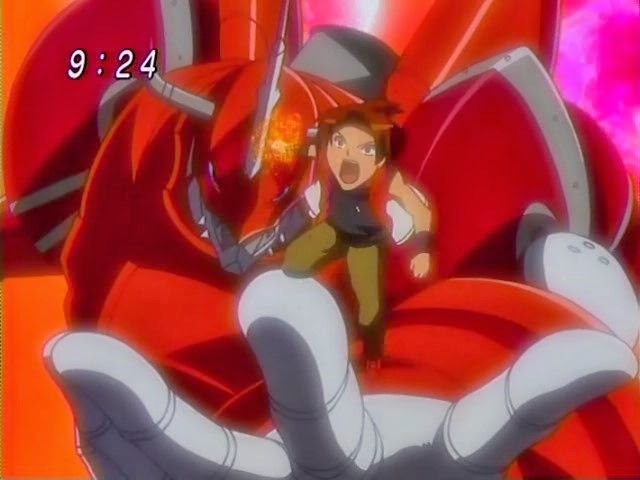 It's the kind of intimate moment between child and monster that made Takato and Guilmon's friendship so special... only with more punching. For an episode that's about Marcus using the Burst Mode, his and Agumon's parts are relatively straightforward. What really sells it is the contributions from everybody else. Thomas barking out commands, Yoshi dive-tackling Keenan to save him (usually it's the boy diving to save the girl! 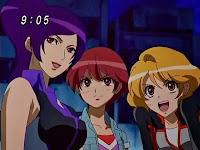 ), and Miki and Megumi standing strong with the main cast is all golden. The Digital World appearing in the sky is so season one, but somehow it seems even more sinister here, perhaps because we see how it happened, perhaps because the art's improved so drastically since then. It's rare for a human to out and out die over the course of the action, but they make it count every time. The way Kurata goes out is practically the reverse of Oikawa's death- instead of utter misery followed by peace, he still thinks he has a Plan C in his pocket until he realizes that it's going to kill him. My absolute favorite episode. The hype of Burst Mode was just so amazing!!! You missed how Thomas just yelled out, "It's fighting time!" That was pure awesome for him, despite the lack of emotion he says it with. God, Kurata was such a joke. Easily the worst villain in the franchise. Could have potentially been great. But we ended up with a first prize moron with stupid motives. His demise was long overdue.